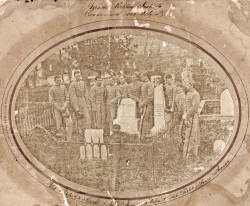 Biography & Genealogy: Franklin Graham Gibson, Class of 1868: New Market Cadet; Private, Co. B. Genealogy: Born- November 24, 1844, in Lewis Co., W. Va. Father- William Gibson; Mother- Isabella Graham. Pat. Grandfather- John Gibson; Pat. Grandmother- unknown. Mat. Grandfather- Thomas Graham; Mat. Grandmother- unknown. Never married, no children. Careers: Teacher-Lawyer. Died- November 3, 1903, in Iatan, Mo.